With last night's suffocation of the Pittsburgh Pirates' offense by Chicago Cubs' rising star Jake Arrieta, the North Siders shot into the lead position among National League contenders. Rational Pastime's playoff simulator now projects the Cubs as 34% favorites to represent the Senior Circuit in the Fall Classic, and 5:1 to win it all. Two consecutive games in which the better team (which also happened to be the road team) won has taken a small toll on the Blue Jays' chances. 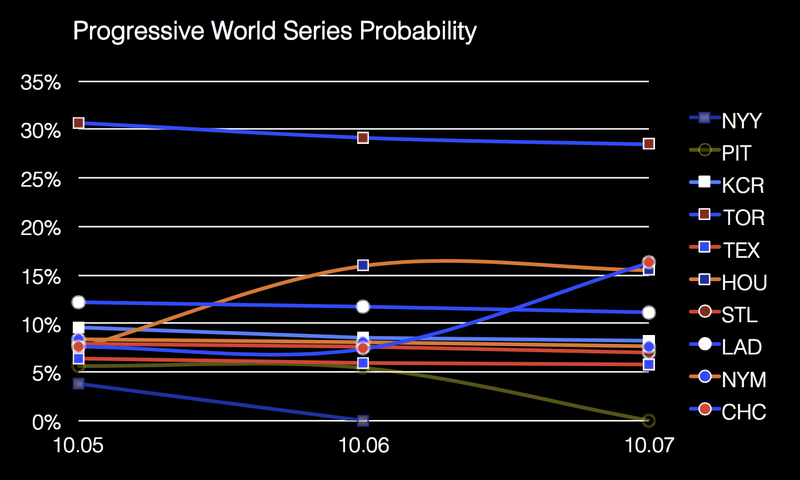 Despite having not played a single game this postseason, Toronto's World Series probability has declined from 32% to 28%. The rest of the field experienced similar but smaller declines following victories by Houston and Chicago. 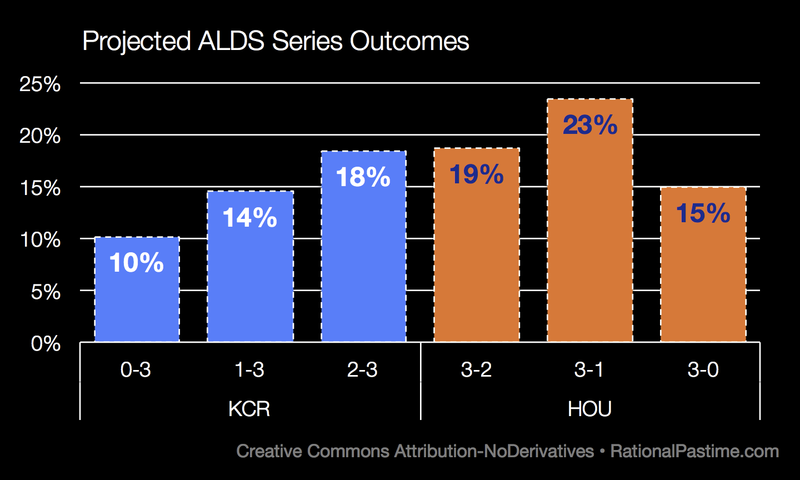 The Kansas City Royals (seventh in RPScore) may have the better record and, with it, home field advantage in the American League Division Series, but the RPScore model finds that the Astros (second in RPScore) are a better squad. As a result, the playoff simulator considers the modal outcome to be a Houston win in four games. The Royals' best chance is to force a game five in Kansas City. 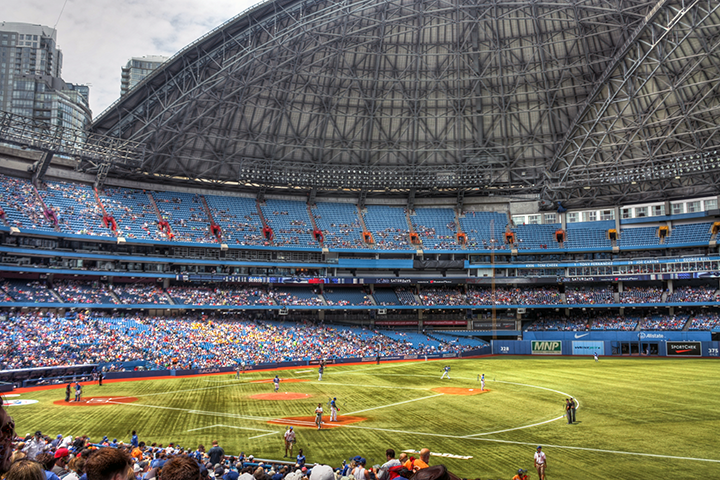 In the 2-3 seed ALDS matchup, the Toronto Blue Jays (first in RPScore) enjoy the advantages of home field as well as a better estimated true record than the Texas Rangers (11th in RPScore). 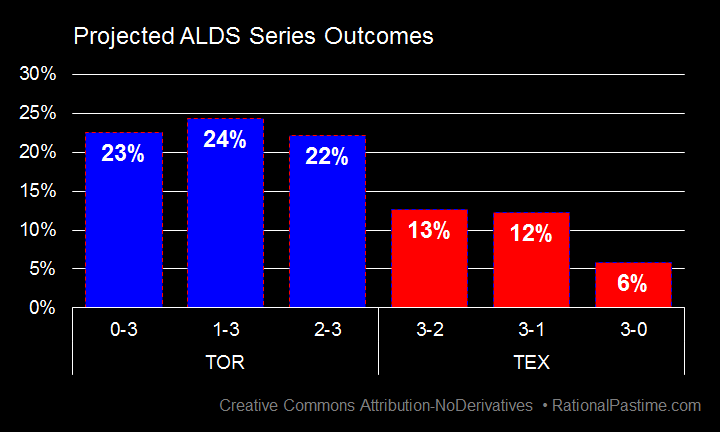 Accordingly, the playoff simulator finds all possible Blue Jay winning scenarios more likely than all possible Ranger winning scenarios, with the modal outcome being a Jays win in game four in Texas. Chicago has usurped both the Los Angeles Dodgers' and Houston Astros' positions on the World Series final result leaderboard. The playoff simulator now expects the World Series to end with Toronto dashing Cubs fans' hopes once again in game six in Toronto. Conversely, the Cubs' best hope for ending their generations-long World Series slump is to force a game seven in the Great White North. 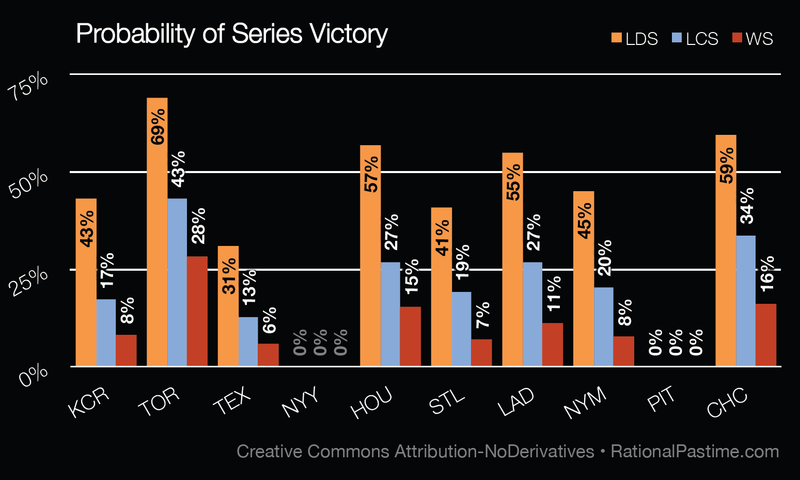 Stay tuned to see how today's ALDS play affects each teams chances for October (err, November) glory. Yes, major *doyyy* on my part. Fixed!